Peter Kowald à Chicago, en public lors de l'édition 2000 de l'Empty Bottle Festival ( en trio avec Fred Anderson et Hamid Drake et avec Floros Floridis et Günter Baby Sommer ) et en studio ( en solo et en duo avec Ken Vandermark ) auquel s'ajoute des interviews de tous ces musiciens. 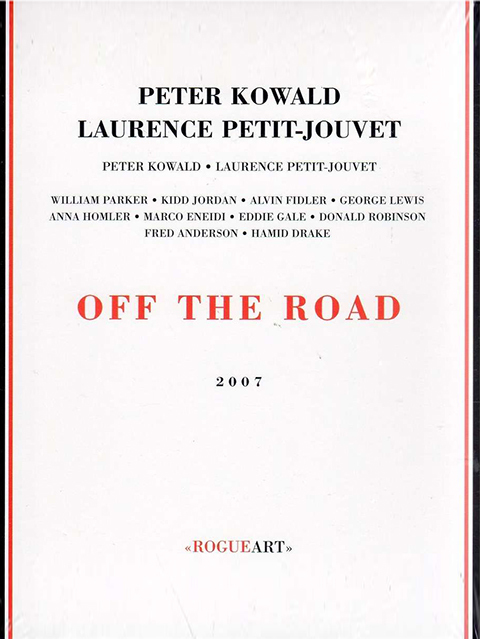 Off the Road Published: August 26, 2008 By Kurt Gottschalk Discuss Peter Kowald / Off The Road / Rogue Art / 2007 Pretty much anyone who ever met the German bassist Peter Kowald has a story to tell. His commitment to community, to creative spirit, seemed to provide him with a charmed life. Laurence Petit-Jouvet's 2001 documentary Off the Road doesn't get into the many stories get told about Kowald—it isn't quite a biopic—but it does serve as a window into the persona that, along with a deep understanding of communicating through music, made him the embodiment of the creative spirit. Petit-Jouvet followed Kowald on an unbooked tour across the United States in 2000, two years before his untimely death at 58. The film—now available as a part of a three-disc set from the French label RogueArt—opens with Kowald buying a used car in New York and setting out across the southern states, to the West Coast and then to Chicago, meeting people and setting up ad hoc gigs en route. Needless to say there's plenty of great music along the way, meetings with Kidd Jordan, George Lewis, Rashied Ali, Pamela Z and many others. But the best parts of the film show Kowald without his bass: engaging a panhandler on the street, talking to people and learning about Martin Luther King and Native American culture, even seeming bemusedly curious about why his old station wagon broke down. The 72-minute film doesn't include a lot of music, just passing scenes along the journey. But it's wisely packaged here with another Petite-Jouvet film from the same tour. Chicago Improvisations documents Kowald in the studio and at the Empty Bottle Festival. If the music is secondary in Off the Road, here the performances stand out against the brief interview segments. He's seen in trios with Fred Anderson and Hamid Drake and with Floros Floridis and Gunther “Baby” Sommer, nicely shot with multiple cameras and good quality sound, and in the studio playing solo and with Ken Vandermark. And if the savvy listener still seeks more sounds, the set comes with an audio CD, also recorded along the 2000 trail. Production Notes: DVD 1: 72 min, color, in English, French subtittles; DVD 2: 83 min, color, in English, French subtittles; CD: William Parker/Peter Kowald duo; Kidd Jordan/Peter Kowald/Alvin Fielder trio; Peter Kowald solo; George Lewis/Peter Kowald duo; Anna Homler/Peter Kowald duo; Marco Eneidi/Eddie Gale/Peter Kowald/Donald Robinson quartet; Fred Anderson/Peter Kowald/Hamid Drake trio. This article first appeared in All About Jazz: New York.